So the good Knight Rider fun at the Auto show was running into JJSoCrazy, was really great to finally meet him after chatting for so long on this forum. So thank you for introducing yourself. Ugh. So nestled in the WAAAAY back of the 2nd floor (bottom level) of the New York Auto Show is a small collection (under a dozen) of Star Cars. One of them happens to be our friend KITT. Or a horrid impostor of him. Lots exterior and interior completely wrong and awful. Plus the most offensive thing of all is the Barris badge on the Car. Here is what I see, feel free to add your own. i'm offended. that is an insult to the knight rider legacy. I think that is created very badly, because this will be the same original of the car KITT, because the lack Scanner, Dashboard and many others, so every car KITT has to be unique and original. The true of the car KITT when the actor David Hasselhoff participated in the series television Knight Rider of the 80 years was spectacular and the Super Pursuit Mode KITT also. The creators Jay Ohrberg, George Barris and Dennis Braid created the cars Knight Industries Two Thousand that is Pontiac Firerbird Trans-Am Super-Cars KITT it was a great success. The car KITT will be the greatest story ever! Is this the El Coche Fantastico (Supercar)version? You know a blatant, low grade, lack of attention to detail knock off? I'm surprised Barris would "approve" this. From what I can tell in the photos and i'm not even a replica expert here, the front bumper orange "turn signals" are horrid, it has no louvers or accurate foglights/grooves (those are never "squared" off, Scheffe insisted on curves and rounded corners) - the scanner is a flat JC Whitney bar (they used two of them in the Impala on Supernatural's Knight Rider spoof "Changing Channels"). It has what looks like yellow construction lines along the "dash" - which looks more like something out of Tron. I spot red, green, and blue countdowns? They look like glued on legos? Do you have any close ups of the dash details (besides c-net)? I'd love to see more photos of it just for the sheer absurd nature of it all. The "gullwing" is a joke, as is the single tv unit. I dare say the only accuracy on this thing is the spoiler and blackout. Even the KNIGHT Plate is synthetic and looks to be made of plastic. Clearly this is the worst claim to screen accuracy for K.I.T.T. I've ever seen and I've seen some pretty weak looking replicas in my time at various shows. 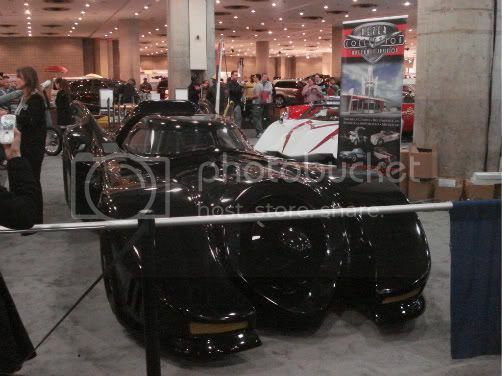 On another note, how was the "Burton" Batmobile in the background - did that have a Barris badge too? The interior looks off on that one too but not as bad. There's no "red" on the gauges in the actual screen accurate car. Kudos for meeting Joe, he's such a great fan and an asset to the KR community. I might go there this Sunday seeing as how i've never seen a kitt replica up close yet.I haven't gone to the auto show since the Michael Keaton Batmobile was shown about 3-5 years ago along with a motts applesauce taxi cab,and Michael Jordan's porche. I have to say that this disgusts me on so many levels. The sheer absurdity of the cheapness is particularly offensive, given that it’s presented as a “star car,” which to me, is an affront to the work that went into designing, building and maintaining the cars that were featured on the show. Suffice to say that given the choice, I’d take a basic dashboard with cardboard buttons and gauges over this, because at least the dashboards that were used in the stunt cars tried to replicate the look of those in the hero car at a cost that was effective for the lunacy, and likelihood of destruction that was associated with those cars. Aside from the blatant inaccuracies and atrocious dashboard, the actual upholstery and PMD seats appear to be nice, judging from the pictures. I will try to make it to the show this weekend and check it out for myself. 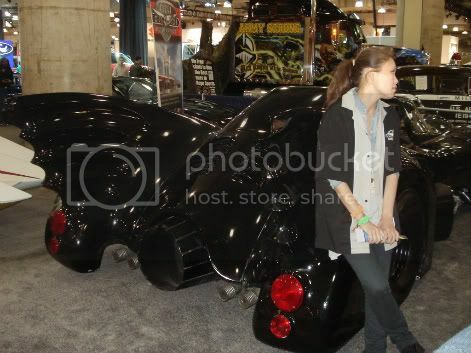 I have a Polaroid of my father and I standing beside the Tim Burton Batmobile in 1989 at the Javits Center. I've always wondered if that was a replica or screen-used vehicle at that time. I also have a Polaroid of me sitting in the Back To the Future DeLorean a couple of years later, also at the Javits Center, but vividly remember all the Time Circuits being red (instead of the accurate red, green and amber colors) and the Flux Capacitor not having any lights. There was a plaque next to it stating it was a screen-used vehicle and its value at the time, but I am not sure since I heard that parts for the DeLoreans that toured were cannibalized and swapped around between cars. I'll try and find the pictures and scan them this week along with my own K.I.T.T. pictures if I make it to the show. Victor Kros wrote: Even the KNIGHT Plate is synthetic and looks to be made of plastic. Was the original "KNIGHT" license plate in the original series synthetic also? I ask because a couple of years back on this site there was a thread with a supposed screen-used real "KNIGHT" license plate, but the letter "I" was a different font than the plate on the show, which caused a lot of debate as to whether it belonged to a stunt car or not. I concluded that a real California license plate would have had the different letter "I" (as the one in the eBay auction in question) and that it was different on the show because it was never a real plate. That's just speculation on my part, though. I do know that the producers had to pay off whoever the owner was that had the "KNIGHT" plate before the series started. I am highly offended by this cheap money-grabbing attempt of a "star car" the New York Auto Show's crew allowed on the floor. Honestly, it's a mockery of KITT and of all the replica owners that do all they can to make their Trans Ams into KITT as accurately as possible. I could do better with cardboard boxes, duct tape and paint. In the least, mine would have the correct colors in the correct places. Sheesh! The front is atrocious to look at to say the least. Those orange lights have GOT to go. They're disgusting! The scanner isn't much better. I would've let that slide a bit had the rest of the car been better. At least the body and the tan interior look well-kept for the most part (I say that because the photo of the driver-side door seems to lead me to believe said door isn't sitting properly with the rest of the frame) and they got the hood/spoiler/blackouts/wheels right. It further proves to me they just want your money and don't care about quality. Cars shows went downhill years ago, IMO. Yes it was a pleasure to finally meet Neps at the auto show! It was such a coincidence, I knew from far away it was him so I figured to say hello, nice to see you with your son having fun! Thanks for the appraisal btw Nick, hopefully we will meet soon also! I also saw KITT downstairs and I actually got to take a picture up close with it, they actually let me go right next to the car. The outside was ok considering the nose lined up really well, however the interior was DISGUSTING! I mean couldn't they come up with something better than that? I will post pics of me and KITT when I get them from my iPhone downloaded to my computer. BTW Neil you forgot to mention the A-team van upstairs! It was nice to see it in person I guess promoting the new movie coming out. 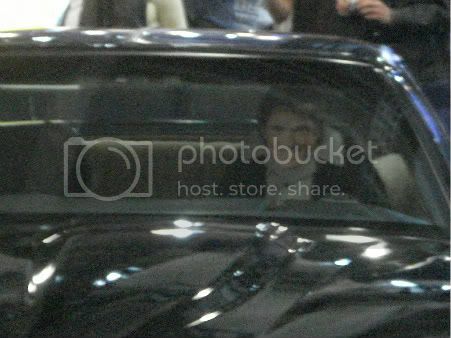 iKITT wrote: I am highly offended by this cheap money-grabbing attempt of a "star car" the New York Auto Show's crew allowed on the floor. Honestly, it's a mockery of KITT and of all the replica owners that do all they can to make their Trans Ams into KITT as accurately as possible. I could do better with cardboard boxes, duct tape and paint. In the least, mine would have the correct colors in the correct places. Sheesh! The front is atrocious to look at to say the least. Those orange lights have GOT to go. They're disgusting! The scanner isn't much better. I would've let that slide a bit had the rest of the car been better. At least the body and the tan interior look well-kept for the most part (I say that because the photo of the driver-side door seems to lead me to believe said door isn't sitting properly with the rest of the frame) and they got the hood/spoiler/blackouts/wheels right. It further proves to me they just want your money and don't care about quality. Cars shows went downhill years ago, IMO. it looks shiny and still sleek. This is so horrible that I cannot find the words to describe it. Just terrible... but this isn't the first time this vehicle, with the Barris badge, has been spotted. I vaguely remember this terrible abomination being shown somewhere else a couple of years ago. Pretty sure it was one these boards; if not, on Registries. I dunno what's worse, the random lights to the sides of the display, or those yellow stripes. No, the whole package is some sort of horrific joke. So I caught the Auto Show yesterday and caught a glimpse of this...car. Apparently they all belong to a private collector and the Batmobile was supposedly one of 7 screen-used cars and is built upon a Corvette chassis. 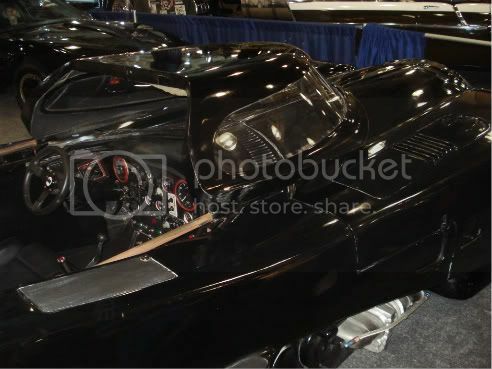 It is well documented that a corvette chassis is too small to accommodate the length of the custom fabricated batmobile "body kit" unless you substantially modify the chassis to extend it. This one in NY is probably not screen used and the interior was definately off from the original. It's a good bet that K.I.T.T. 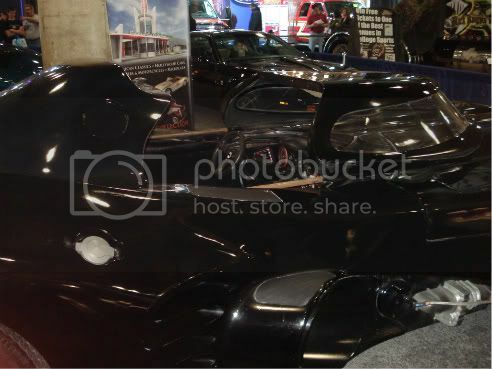 wasn't the only star car "knock-off" claimed as an "original" screen used car displayed at the show. I enjoyed it last Wednesday.I got my friend to go with me.Cost me about $28 to see this kitt even if it was an insult to all kitts out there.I asked the show lady if she could take a few pictures of me in front of kitt.I had about 30 people around jealous that I crossed the velvet rope lol.Then I went around the other side to get some pictures of kitt's bumper.I asked the other show lady from the back If I could get some pics of kitt. In oe of them I was thinking it would be funny to look like I was breaking into kitt.The flash from my phone made the blackout in the back show the pontiac lights.Also there was a David Hasselhoff poster on the inside of the car placed on the drivers side seat.The dashbopard looked like it had some glued on fake jewelry lol. Sorry those links don't work.I added it to my photobucket. Hey, nice shot of that interior. It's even more horrible than I thought!!! Yellow, blue and purple stripes?!? "One man can make a difference"